Whether merchants and restaurateurs sell to sit-down or on-the-run diners or both, Rip Van Wafels are a great addition to their selections. These treats can be enjoyed in a variety of ways. With yogurt or nut butter, possibly combined with fruit and nuts, they can be a satisfying morning snack or the main course of a nutritious breakfast. Unlike old-fashioned waffles, they�re easy to eat on the run, making them a convenient choice for savoring while commuting. In the afternoon, they�re yummy warmed over a hot beverage or eaten straight out of the package. Ingredients in Rip van Wafels include dairy products and no more than eight grams of sugar. These 130-calorie treats contain no GMOs, artificial flavors, trans fat, preservatives or high-fructose corn syrup. 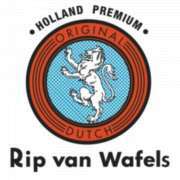 Rip van Wafels were the brainchild of Amsterdam native Rip Pruisken who was dismayed to learn that waffles were not a mainstay of the typical American coffee break. Thanks to him and the company he helped found, wafels -- as they are known in Holland --are now enjoyed from coast to coast in the U.S.